Also check out this article from the same issue: A behind-the-scenes look at the development of Appleâ€™s Lisa. Next week I have similar reviews coming for the Apple //e and the original Macintosh. What could I say? Not very much, for two reasons. First, he was absolutely rightâ€”we need all that and more before computers become as commonplace as color TVs and electric typewriters. Second, I had agreed not to talk about a computer I had just seen that meets many of his points: Apple Computer’s highly secret Lisa computer (see photo 1). Before we take a detailed look at what the Lisa is and how it came about, let’s look at an example of what it can do. Suppose I’m writing a report for my boss and I want to prepare a chart to illustrate a certain point. With a few movements of the mouse (more on this pointing device later), I “tear off” a sheet of Lisa Graph “paper” (thus activating a program called Lisa Calc and displaying an empty grid on the screen) and give it the heading “Annual Sales.” I then type my numbers into the grid, name the graph and the x and y axes, and request a bar graph. Voila: I get the bar graph (superimposed on top of the data) shown in photo 2a. At this point, I can simply print the graph or save it for inclusion with my report, but I’m not satisfied with the way it looks. I then use the mouse to “cut” the graph from the Lisa Graph paper and put it in a temporary storage place called the clipboard. I can then “throw away” the Lisa Graph “paper” I was using. My next step is to “tear off” a sheet of Lisa Calc “paper” and paste my “Annual Sales” bar chart from the clipboard onto it. Photo 2b shows the result. I want to make the bars darker, so I use the mouse to move the cursor (the arrow pointing diagonally up in photo 2b) onto the rectangle and tell the computer that I want to work on that bar by clicking the button on top of the mouse twice. (I could almost as easily have selected all four bars, but I’ll just do one here.) As a result, the bar is selected, as shown in photo 2c. (In the Lisa system, you first select what you want to work on, then you select the action you want performed.) The small black squares that appear on the edge of the object are called handles; not only do they show which object has been selected, they also serve as “handles” by which the cursor can move or alter a shape. Now that the bar is selected, I move the cursor to one of the menu titles at the top of the screen (also shown in photo 2c). I see the menu of possible actions by pointing the cursor at the menu title and holding down the mouse button (photo 2d). Here, the menu is a grid of 36 varieties of shading that can be used to fill the selected area. When I move the cursor to the desired shade box and let up on the mouse button, the pop-up menu, as it is called, disappears and the shading fills the box (photo 2e). It is equally simple to change the size, type style, and position of the title “Gross Sales.” By holding down the mouse button when the cursor points just to the left of the first letter and letting it up when the cursor points just past the last letter, I can select an area of text that the Lisa then puts in reverse video (photo 2f). When I select an option from the ‘Type Style” menu (photo 2g), the text is redisplayed in its new size and style (photo 2h). I then modify the title to an italic font in a similar way (photo 2i). Finally, I pick up the title with the cursor, “drag” it to a new location, and leave it there (photo 2j). Many other alterations are possible. When I’m satisfied with the graph, I can print it, save it, or do both. This example conveys only a fraction of the speed and the ease of use associated with the Lisa computer and the programs that go with it. Now that we’ve seen the system at work, let’s take a look at what makes it so different. The design effort that resulted in the Lisa computer is remarkably innovative because the designers did what designers should doâ€”define the product’s prospective customers, determine their needs, and then design a product to meet those needs. Apple was also willing to give its designers enough time and money (with no marketing restrictions attached) to first design and then create a computer that redefines the expression “state of the art.” Granted, the Lisa’s designers drew heavily on previous work done at Xerox PARC (Palo Alto Research Center), but they refined several borrowed elements and combined them with numerous innovations. (For further information on the design process, see “An Interview with Wayne Rosing, Bruce Daniels, and Larry Tesler” on page 90.) Apple started this project with the intention of creating not only a product but the foundation for a whole new computer technology, one that would create computers literally anybody can use. The company’s first task was to devise a new user interfaceâ€”that is, a new and better way for humans to interact with the computer. The result was an internal (to Apple Computer Inc.) “User Interface Standards” document that describes how a user interacts with the Lisa system. Although the Lisa design has several important elements, four stand out: the machine’s graphics-mouse orientation, the “desktop” and “data-as-concrete-object” metaphors, and the integrated design of the hardware and software. Let’s look at each of these in turn. The graphics-mouse orientation: The traditional text display and keyboard input device make for a computer that isâ€”let’s face itâ€”not too easy to use. Apple decided that the graphics resolution of the machine had to be high enough to use pictures (often called icons by Apple) in place of text. (For example, see the icons on the right-hand side of photo 2a.) Pictures are more easily recognized and understood than text. Because of this, you can probably figure out that the garbage-can icon in photo 2a is used to throw something away. Apple also knew that it needed a new, easier-to-use input device to move the frequently used arrow-shaped cursor. The designers passed over such devices as light pens and touch-sensitive video panels in favor of the mouse, a pointing device used in several Xerox PARC machines. The mouse, which is about the size of a pack of cigarettes, has a small bearing on the bottom and one or more buttons on the top (see photo 3). When you hold it in your hand and slide it across a flat surface, the mouse sends signals to the computer, which guide the video cursor in the direction that you’ve moved the mouse. The mouse Apple designed has only one button; Apple broke with the conventional wisdom of two- and three-button mice after user tests indicated that people aren’t always sure which button to push on a multiple-button mouse. With graphics of sufficient quality and a mouse, the Lisa lets you get what you want by pointing at it. Because the video cursor moves in direct response to the way the hand moves the mouse, you feel as if you’re actually pointing at something on the screen. This has the positive psychological effect of making you feel in control. The “desktop” metaphor: When you turn on the Lisa system, the screen is empty except for the presence of several icons. The Lisa computer depends on the metaphor that the video display is a desktop, while the icons are objects on the desktop. Each peripheral connected to the Lisa (floppy and hard disks, printers, and other peripherals connected by interface cards) is represented on the desktop by either an icon (if it is not in use) or a rectangular area called a window (if it is available for use). The Lisa computer normally replaces the conventional file directory with a collection of objects displayed in the window of the associated mass-storage device. Each file is represented by an object of some sortâ€”usually a report, a tool, or a documentâ€”and objects can be grouped together in folders, which are also treated as objects. (Actually, the computer can give you a conventional directory on request, but only traditional computer users will ask for this option.) An example of the Lisa file system will illustrate how useful this metaphor is. From a cleaned-up desktop with nothing but icons on the right of the screen, I use the mouse to point to the Profile (hard disk) icon and click the mouse button twice; this has the effect of “opening” the Profile and displaying its contents. The Profile icon changes to a white silhouette and its original black-on-white shape expands to a window named “Profile.” ( Photo 4a was taken after three itemsâ€”shown as black iconsâ€” had been selected for manipulation. When the Profile icon is first opened, all of the icons inside it are whiteâ€”that is, unselected.) To view and then work with the contents of the Tools folder, I put the cursor on the folder and click the mouse button twice. The icon expands, leaving a gray silhouette and a window named “Tools,” as shown in photo 4b. The window is just thatâ€”a window into whatever the Tools folder contains. The symbols on the margin of each window are points from which the cursor can direct several operations on the window. For example, when the cursor points to the small folder icon in the upper left-hand corner of the Tools window and the mouse button is clicked twice, the folder “closes” and the video display reverts to the image it had before the folder was opened. If the Tools folder contains more than the window can show, you can do one of two things to see the additional contents. First, you can scroll the window either horizontally or vertically. Second, you can put the cursor on the expand/contract icon (in the lower right-hand corner of the window), hold down the mouse button, and move the cursor. An outline of the window follows the cursor (photo 4c); when the mouse button is released, the window grows to its new size (photo 4d). Once you’ve been shown the mechanics of manipulating objects and windows, you have a working knowledge of several essential operations of the Lisa file system (called the “Desktop Manager”). The desktop metaphor does two things for you. It helps you to remember certain operations because they make sense in the context of the object-related icons. Second, it draws on your general knowledge of office supplies and how they are used. These elements help Apple achieve its objective of creating a system that people can learn to use some aspect of in under 30 minutes. The “data-as-concrete-object” metaphor: More than anything else, this metaphor is the foundation of the Lisa computer design and its probable success. As you can see from the example above, the Lisa file system makes you feel as if you are actually moving and changing objects, not merely manipulating abstract data. The Lisa Graph/Lisa Draw example shown in photos 2a through 2j creates the same illusion, as do all the other Lisa application programs. The “data-as-concrete-object” metaphor depends on a condition most computer programs don’t fulfill: that intuitively reasonable operations can be performed on objects at any time. Most computer programs have modes that restrict your activities at any given time; for example, many word-processing programs don’t let you do numeric calculations and then incorporate them into the document you’re writing. With the Lisa application programs, however, you can switch your attention from a sheet of Lisa Write “paper” to a sheet of Lisa Calc “paper” and back with no problem, just as you could if they were two sheets of paper on your desk. Because you deal with recognizable objects such as folders and reports, you feel secure in the knowledge that your data will not disappear. “After all,” it seems to be telling you, “computer files can mysteriously disappear, but folders, reports, and tools do not. If a file disappears, there’s a logical explanation â€” either you threw it away or you filed it elsewhere. In either case, the situation is still under your control.” In other words, the “data-as-concrete-object” metaphor demystifies the computer by transforming data into physical objects that behave in a predictable and reasonable way. Integrated design: Not only is the Lisa computer the result of an integrated design, it is also the result of an iterated one. The Lisa hardware and software were designed only after Apple had identified the needs of its target users. Once a given version of the system was implemented, it was tested by the kind of people who would eventually be using it. The test findings dictated hardware and software changes, and Apple went through the design/test/revise cycle several times until everybody was satisfied with the result. This ensures that the Lisa does not fall prey to a problem common to microcomputers: being technologically sophisticated, but still hard or inconvenient to use. During the iterations of the design process, the Apple design team looked for opportunities to have separate Lisa programs do their tasks in the same way. It then incorporated these common operating procedures into the Apple user-interface standard and tried to apply them to other Lisa programs. The result is a large amount of common behavior and structure among all the Lisa programs. For example, you enlarge or move a window the same way whether it is a Lisa Calc window or a Lisa Draw window. You also open, close, copy, and rename objects the same way throughout the system. According to Apple, this attempt at standardization has two advantages. First, it shortens the time an average person takes to become comfortable with a system from a range of 20 to 40 hours (Apple’s estimate, based on tests it conducted) to several hours. Second, it lets you apply what you learn in one program to all other programs. This commonality among Lisa programs is largely ‘ responsible for the ease with which beginners learn how to do something useful on the Lisa computer; it usually takes less than half an hour, even for people who have never sat in front of a computer before. The Lisa system will be offered with six application programs. Both new packages and improved versions of the first six programs will be offered at a later date, and in time third-party software developers working with cooperation from Apple will create additional programs. At this writing, no price had been set for the programs, but Apple expects them to cost between $300 and $500 each, a justifiable price for programs of this caliber. I don’t have room here to describe all the features of each program. Instead, I will comment briefly on each one and say that, in general, all of them have more options and features than most people will use. (See photos in which popup menus are visible for an idea of some of the commands available.) One in particular deserves mention: the “Undo Last Change” command, which is available in every program. This wonderful command lets you undo the effects of the last one you issued. It’s a tremendous security blanket that enables you to experiment and work without worrying about making an irrevocable mistake. Here are the six application programs (a telecommunications program, Lisa Terminal, is covered in the section on “Communications and Databases.”): Lisa Draw is easily the showpiece of the Lisa system. The example in photos 2b through 2j shows only a small part of what it can do. See photos 2d, 2g, and 5a through 5d for some of the pop-up menus. Lisa Draw enables you to draw lines, boxes, circles and * ellipses, arcs, and polygonsâ€”all with the mouse. You can add text at any place in any of 11 typeface/size combinations. In addition, you can modify any typeface with any combination of underline, bold, italic, hollow, and shadow styles for a combination of 11 X 25 or 352 distinct kinds of type. Lisa Draw has grids and rulers that can be displayed to help make drawings neat. Shapes can be selected and centered by a given horizontal or vertical edge. You also put Lisa Draw in an “auto-grid” mode that causes lines and shapes to align themselves with the grid you have chosen. Drawings can cover as many as 25 pages; Lisa Draw prints them out a page at a time and you join the edges together to make a larger drawingâ€”a convenient feature if your drawing can’t fit on one page. This program is a joy to use. Lisa Write is the best “what-you-see-is-what-you-get” word processor I’ve seen. Between the keyboard and the mouse, you can add, change, delete, and move text, change its appearance, reformat it, and do just about anything you’d want to in a word processor. Of course, you can see each page exactly as it will appear on paper (see photo 6). My only criticism of the program is that the version I saw paused a second or so between when I typed a phrase and when it appeared on the screen. The delay is due to the large amount of processing the machine has to do before it can display the new text (and perhaps scroll other text down), but the designers are aware of the problem and are working on minimizing the time delay in the final version. Lisa Project is used to keep track of projects and personnel, and it does so using PERT (Program Evaluation and Review Technique), Gantt, and task charts. Using the mouse and the keyboard, you can add, delete, move, change, and label activity boxes. Each box contains the activity name and its personnel and time requirements. The Lisa Project program displays the PERT chart (see photo 7a), drawing a heavy outline around the activity boxes on the critical path (a path of activities for which delays will lengthen the duration of the project). The program can also optionally use such information as worker vacation times and the length of the work week to influence the final chart. You can also have the program show the early-start, early-finish, late-start, and late-finish dates associated with the PERT method. The Gantt chart (photo 7b) shows resource utilization over time, including unutilized resources (shown in gray). The task chart (not shown) displays tasks by their early-start date. Like the rest of the Lisa system, Lisa Project gives you incredibly clear error messages. For example, when you try to take the “end” circle off the screen, you get the error shown in photo 7c, which must be answered before you can continue. Lisa Calc is as sophisticated a spreadsheet program as any other on the market. In this instance, I don’t think the mouse improves on cursor keys because one hand has to alternate between the mouse (to move the spreadsheet cursor) and the keyboard (to enter data into the spreadsheet cells). In any case, most people who want a Lisa computer are interested in the kind of structured numeric recalculation that spreadsheets are good at, and Lisa Calc certainly fills this need. Of course, data can be traded between Lisa Calc and other Lisa programs without restriction, which means, for example, that you can “paste” a section of spreadsheet data into a document being prepared by Lisa Write. Photos 8a and 8b show the process of displaying the formula of each cell along with its value. Lisa List, a single-user database that permits records of up to 100 fields totaling 1000 bytes, probably illustrates best the “data-as-concrete-object” metaphor. When you add, change, or search for records, you work directly on the list visible in the window, not on an auxiliary display (like a data-entry screen) that limits you to working on the current record only. Record fields are defined as being one of eight data types (text, number, date, money, time, social-security number, phone number, or zip code), and Lisa List does automatic type-checking during data entry. Photo 9 shows an example of a Lisa List window. One slight problem is that the social-security number, phone number, and zip code fields have fixed formats â€”for example, zip codes are limited to five digits. You must revert to the general-purpose text format if you want to be able to convert to 9-digit zip codes or use foreign telephone numbers. Lisa List has many attractive features. Of course, you can display or print parts of the list in many ways; you can sort the list in several ways or select records according to given criteria. You can move the cursor with either the mouse or the arrow keys. The contents of fields are stored internally in a compact form to increase the overall storage capacity of the program. In addition, Lisa List has two very useful features that every database should have: the ability to add fields to or change field widths in an existing file and the ability to put any amount of information in a field regardless of its stated width (field width influences only how much data is visible). Lisa Graph is an application program that creates a bridge between the number-oriented Lisa Calc and the picture-oriented Lisa Draw. Lisa Graph takes a matrix of numbers (entered either by the user from Lisa Graph or transferred from another source) and creates virtually instantly a bar, line, mixed bar and line, scatter (x-y plot), or pie chart. Photo 2a shows a typical Lisa Graph window, and the sequence of photos 2a through 2j shows how Lisa Draw can customize a drawing from Lisa Graph. Computers are worthless if nobody uses them, and the i Lisa system has made great strides toward eliminating that possibility. Certainly, it has been designed to be easy to use. But the Lisa system will probably be used by computer novices because of its reliability, both in the physical and psychological sense. Physical reliability is the kind that makes an engineer feel secure. Apple IIs, for instance, have a reputation for being very reliable, and I’m sure that the Lisa computer was engineered with even more care. (For example, the Lisa is constructed as a series of modules, any one of which you can pull out without tools. And despite its internal complexity, it was engineered to dissipate excess heat without a cooling fan â€”that’s engineering!) I can’t say how reliable the Lisa is overall because I don’t have enough direct experience with it. But I do know that Apple has concentrated on improving the reliability of the source of a great many problems: the floppy disk. Despite the features of the Lisa disk drive that put it at the leading edge of disk technology (see the text box “The Lisa Hardware” for more details), Apple claims that the hardware (assisted by its sophisticated disk-accessing software) has an error rate so low that Apple couldn’t quantify it during tests. Apple said, however, that the hardware makes less than one error in one trillion (1012) operations. Apple has also adopted a redundant data structure for information on the disk that lessens (or sometimes eliminates) the effect of losing a sector of information. This redundancy is on three levels â€” blocks, files, and The Lisa Hardware. Reporting on the technical specifications of a computer toward the end of an article is unusual for BYTE, but it emphasizes that the why of Lisa is more important than the what. For part of the market, at least, the Lisa computer will change the emphasis of microcomputing from “How much RAM does it have?” to “What can it do for me?” For example, it is almost misleading to say that the Lisa comes with one megabyte of RAM, even though the fact itself is true. That doesn’t mean that the Lisa is sixteen times better than machines that have 64K bytes of RAM. Nor does it necessarily mean that the Lisa can work on much larger data files than other computers; its application programs each take 200K to 300K bytes, which significantly reduces the memory available for data. It’s more instructive to say, for example, that the Lisa with one megabyte can hold a 100-row by 50-column spreadsheet (as its advertisements state). With this in mind, let’s take a look at the Lisa. “Lisa” stands for Local Integrated Software Architecture, but it’s really just an excuse to retain Apple’s pet name for the project. The Lisa has a 68000 microprocessor, which is a true 16-bit microcomputer that has a 16-bit data bus, a 24-bit address bus (giving access to 16 megabytes of memory), and 32-bit-wide registers (all but the 16-bit status register). The 68000 in the Lisa runs at a frequency of 5 MHz. It can have up to 1 megabyte of memory with parity and comes standard with one megabyte (1024K bytes). The video display is a 12-inch monochrome monitor (black and white, not tinted) with a resolution of 720 by 364 pixels. The interlaced image is refreshed at 60 Hz, which eliminates the possibility of eyestrain from subliminal flickering. The video display is completely generated by internal software, so the Lisa can use multiple character sizes and fonts without restriction. It also means that Apple is not restricted to any one style of video image; the designers can radically change the behavior of the system with a new release of software. The Apple 871 disk drives design (called “twiggy drives” inside the company) are significantly different from conventional floppy-disk drives. Each one uses a 6504 microprocessor as a “smart” interface between it and the Lisa. The drives use special high-density, double-sided floppy disks that have two oval cutouts in the jacket (see photo below). These are essential because the two disk heads, in addition to being on opposite sides of the flat magnetic media, are not pointed at each other with the magnetic media between them, as is the case in all other double-sided floppy-disk drives. Instead, a pad presses the rotating magnetic media to the disk head on the opposite side of the media as is conventionally done with single-headed floppy disks. Each formatted disk holds 860K bytes of information at a density of 62.5 tracks per inch; together the two drives (standard on the Lisa) hold 1.72 megabytes of data. Each drive also contains a mechanism that releases the disk for removal under program control, which prevents the user from removing a floppy disk prematurely. As with other Apple products, the floppy disks rotate only when the drives are reading or writing data, thus extending the lives of both the drives and the medium. Apple has done several things to achieve its unusually high data density. The designers used an encoding scheme that keeps a constant data density of 10,000 bits per linear inch; this allows the outer floppy-disk tracks, which have a larger circumference, to store more data than the tracks nearest the center of the disk. In addition, the disk-access system software can move the disk heads in fractions of a track width to search for and find the middle of the track. That’s an important feature when you’re reading disks with small variations in track width. In addition, the Lisa comes with one Profile (Apple’s 5-1/4-inch Winchester-type hard disk) to the Lisa through its parallel port. It adds 5 megabytes of magnetic storage to the Lisa system, and speeds up the overall operation of the system. Additional Profiles can be added via interface cards. The Lisa computer is never really turned off. It stores “system preferences” (things like speaker volume and video contrast) and system-configuration information inside the computer. Even when it is turned “off,” it draws enough power to keep the clock/calendar and CMOS memory containing the above information working. When it’s unplugged (for example, when it’s being moved to another location), internal batteries preserve the clock/calendar status and CMOS memory for up to 20 hours. The Lisa includes two programmable serial ports and one parallel port as well as three expansion-board slots, each of which connects directly to the system bus and has direct memory access (DMA) capabilities. Because none of these slots is filled in any “basic” configuration of the Lisa, they are available for future expansion (unlike the IBM Personal Computer’s five slots, most or all of which are used for much-needed video-display and memory cards). Other features include a built-in speaker and a real-time clock (which can be programmed to execute tasks or turn the computer itself on or off at a given time), a microprocessor-controlled detachable Selectric-style keyboard, and a mouse. I must thank Apple for including something I’ve wanted to see for a long time: unique serial numbers encoded into memory. The Lisa has two of these: an actual serial number disks â€”and a given level in error is correctable by data in the next lower level. On the block level, each 512-byte block of data has a 24-byte area of hint bytes. These identify the file to which the block belongs and its block number within the file. On the file level, each file contains a header that duplicates information in the disk catalog. On the disk level, each floppy disk keeps a file of information about the status of each file on the disk. The Lisa system software automatically tries to reconstruct information that is lost, so it recovers from errors that would halt other computers. Psychological reliability is the kind that makes an office worker secure. The Lisa floppy-disk drive is unique in this respect. On the Lisa computer, you can’t yank your floppy disk out any time you want to (if you could, you might, for example, remove the disk before files on it are updated). Instead, you press the Disk Request button beside the disk-drive slot. The software in the Lisa computer checks your work space, closes any files belonging to that disk (thus updating the file), then ejects the floppy disk so you can remove it. A similar thing happens when you turn the Lisa “off” (actually, it’s never completely off; it just goes into a low-power mode). In any case, when you hit Off button, system software automatically closes all open files, thus transferring the information in them to their respective floppy disks, and releases the disks from the Lisa disk drives. In addition, the software records the status of the “desktop” so that, when the computer is reactivated, Lisa automatically returns it to the appearance and state it was in when the Lisa was turned “off.” Although those who have worked with computers before will find these features hard to get used to, most newcomers will be reassured by them. The design of the Lisa application programs (which are the only things most Lisa users will see) is another example of psychological reliability. Many people have vague fears of computer programs because they think they’ll do something wrong and cause a catastrophe that will make them look foolish. This won’t happen with the Lisa system for two reasons. First, the Lisa software is designed to be very understandable. The metaphors make people comfortable with the manipulation of data, error messages are both clear and complete and tell you what alternatives you have, and, in general, the programs let you know where you stand and the consequences of a given action. Second, the Lisa computer has the “Undo Last Change” command mentioned earlier. With this command, even the most uncertain users will not hesitate to act in a way they think is appropriate. The way Lisa programs work, the user probably is right, and if he isn’t, he knows he can undo whatever happens. People who won’t trust most computer programs will trust Lisa programs. As the engineer I talked to pointed out, no computer is going to be the most important piece of equipment in an office unless it can easily interact with other computers. This need has been integrated into the design of the Lisa system in several ways. First, a communications program called Lisa Terminal allows the Lisa computer to emulate several popular terminals (Digital Equipment Corporation’s VT52 and VT100 terminals and Teletype Corporation’s ASR-33). The Lisa Terminal program includes all the options that a given terminal allows, even down to simulated status lights. A future Apple terminal program will enable the Lisa to emulate the IBM 3270 family of terminals. Second, Lisa computers can be connected together via a new local network called Apple Net, which Apple hopes to promote as an industry standard because it feels that other networks have major cost or performance problems. According to Apple, Apple Net meets four criteria that it thinks are important: it can be easily installed by the user, it is highly reliable, it is easily extendable to include more nodes or to interface with other networks (like Ethernet and other Apple Net networks), and it has a low per-node (under $500) cost. A-Net has a bandwidth of 1 megabit per second, can have up to 128 nodes, uses a shielded two-conductor wire for interconnecting nodes, and can have a maximum node-to-node distance of 2200 feet. Apple Net uses the same method as Ethernet to avoid message collisions (CSMA/CDâ€”carrier-sense, multiple access with collision detection) and is compatible with the Ethernet on the top five of the seven levels of communication protocol. For those who want it, though, Apple will also make Ethernet interfaces available at a cost of about $1500 per node. Third, Apple has distant plans to make it possible for Lisa computers to talk to non-Lisa computers and to shared or remote databases. Although the people at Apple did not discuss specific products, they told me enough to assure me that they are planning extensions in this direction that will make it even more useful. When these items are available for the Lisa, Apple will have overcome a very big problem: really integrating the computer into the full office environment. That usually includes both local and remote computers. Whatever the needs of a given office, the above products ensure that the Lisa computer will be as useful as any other “office automation” product available from other companies. The people I talked to at Apple made it clear that, with regard to Lisa, they were going to offer better service options than any other computer company, including IBM, DEC (Digital Equipment Corporation), and Wang. A diagnostic program called Lisa Test (supplied with the Lisa) enable it to isolate the computer failure to a single board or component; in the case of severe problems (when the disk drives aren’t working, for example), a built-in test program that runs whenever the Lisa is turned on will diagnose and report on the problem. As I mentioned before, the Lisa is designed so that you can take it apart without tools (a detailed manual explains how). Apple offers several service options. If you have on-site service (available through a joint agreement with RCA), you simply call Apple and let a service person fix the problem. For large-quantity customers, Apple can provide training to teach employees how to do in-house repairs. For individuals, Apple Care Carry-In Service is available. In addition, Apple is planning what it calls Direct Phone Support. For a yearly fee, the user will have access to a toll-free number that is answered by a highly trained support person. Apple has high standards for this service, and I’m sure that, once the service has started and is running smoothly, Apple will deliver what it promises. The company expects its representatives to answer 90 percent of the calls received; people whose problems cannot be answered immediately will be called back when the answer is found. If equipment needs to be repaired, the Direct Phone Support person will call the appropriate repair people and dispatch working modules, so that one call will usually solve the problem. Different support-option plans available will range from 9 a.m. to 5 p.m. weekday service to 24-hour-a-day, 7-day-a-week call-in support. Apple also plans to provide software revisions and support through this option, although details had not been decided on at this writing. I have seen only drafts of miscellaneous pieces of Lisa documentation, but they indicate that the final documentation will be superb. Apple plans to provide the Lisa Guide, an interactive teaching program about the Lisa system, and reference books for each application package; each reference book will begin with a short tutorial section that will get users doing useful tasks in under half an hour. Other documentation may be included, but the information was not available at the time we went to press. Even though the Lisa is meant to be a very easy product to use, Apple will provide training to make sure that people learn how to use it. As one Apple spokesperson put it, “Training is part of the Lisa product.” Apple will offer extensive training to all Apple dealers and to selected groups from companies that make large-volume Lisa purchases. Apple will also make training kits available to multiple-unit purchasers to help them train their employees. Individual Apple dealers may offer additional special training. In the microcomputer industry, products are generally announced early (sometimes before they are designed) and released in preliminary versions before all the features have been integrated into them. Apple is to be commended for resisting this practice. 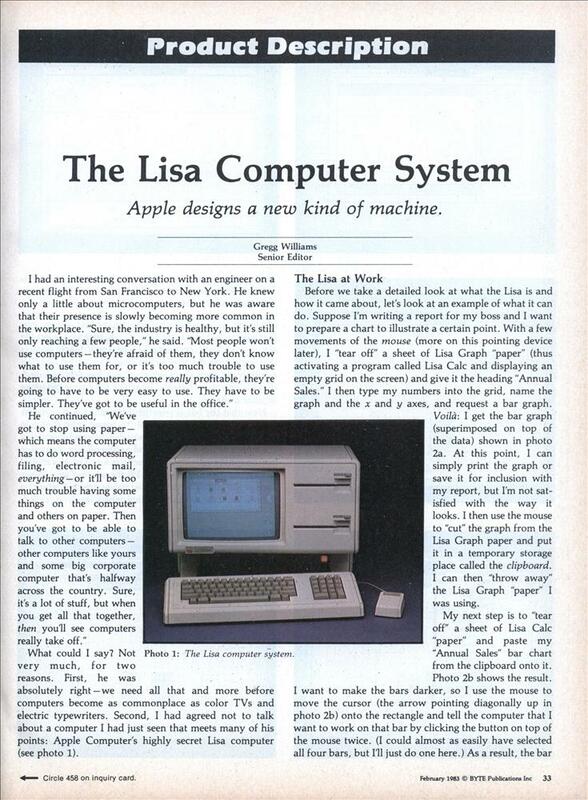 In fact, the company seems to have released a more complete first version of the Lisa than most companies do with their products; the first Lisa sold will be a fine machine. However, the ambitious and talented people who designed and implemented the Lisa computer have already envisioned and planned for quite a bit more than they can implement by release date. I’m sure they have some ideas they don’t want to publicize (and rightly so), but here are some things they were willing to talk about: â€¢By 1984, Apple plans to replace its 512K-byte memory card (two of which can be fitted into the Lisa computer) with 1-megabyte cards, thus increasing the memory capacity from 1 to 2 megabytes. â€¢As soon as possible, Apple plans to introduce versions of BASIC, Pascal, and COBOL for the Lisa. The BASIC will be compatible with Digital Equipment Corporation’s BASIC Plus (unlike IBM Personal Computer BASIC, it will be able to use the extra memory above the first 64K bytes). The first releases of these languages will be “plain vanilla” versions that don’t interact with the computer’s special features (e.g., mouse control of the cursor, windows, the “desktop” metaphor), but later versions will probably integrate these languages into the Lisa system. â€¢Another language that will be available for the Lisa computer is Smalltalk. I was pleased to see Smalltalk working on a Lisa computer â€” a year and a half has passed since our special Smalltalk issue in August 1981, and no commercially available computer to date has used it. Smalltalk on the Lisa computer will change that. It is a very “possessive” language that directly controls the machine it is implemented on, so it will probably never be integrated into the Lisa environment â€” but then, it doesn’t need to be. â€¢Smalltalk is just one example of a language/operating system that can occupy the Lisa machine. The Lisa will also support Digital Research’s CP/M family of operating systems and Microsoft’s Xenix (a licensed version of Unix that includes business-related extensions). Outside developers will be encouraged to carry operating systems acrossâ€”one such possibility is Softech Microsystems’ UCSD p-system. â€¢Apple will be making enhancements to the existing Lisa application programs. On first release, the only limitation in sharing data among Lisa application programs is that you won’t be able to “paste” graphic images into a Lisa Word text document (you can, however, add text to a Lisa Draw drawing). Bruce Daniels, one of the Lisa designers, told me that the design allows for adding graphics to a text document but that they simply can’t implement the feature in time for the first software release. It will be added by the next release. â€¢Apple is very conscious of the fact that the success of the Lisa will be heavily influenced by the availability of good third-party software. To encourage such software, the company will make available a “programmer’s toolkit” package of software and documentation sometime this year. This toolkit will give third-party programmers all the information they need to build on the considerable utility software (window-control, disk-accessing, intelligent graphic-redrawng, and memory-management routines, for example) already available in the Lisa operating system. (The operating system itself is about half a megabyte of code, though only 200K to 300K bytes of it are resident in memory at the same time.) In addition, the toolkit will list the user-interface conventions that were used to create the existing six application pack-ages and will strongly suggest that third-party software will be better received (by both Apple and the consumer) if it follows these conventions. The Apple-generated application programs are so wonderful that most programmers will consider it an achievement to create similar software. I wrote this article after working with a Lisa computer for several hours and studying various Lisa documents. The application packages were completely functional, but I was told changes were still being made to them. The released versions of software may be faster because debugging aids were probably slowing down the version I saw. The Apple Lisa was faster than I remembered a similar machine being (an experimental Xerox machine running Smalltalk) and faster than I expected it to be. Granted, a 68000 microprocessor is in the computer, but it was being asked to do a lot â€” including the manipulation of 32K bytes of video-display memory. Objectively, I must report some delays (30 seconds, maybe) when loading in files, but these were shorter than what I usually encounter using CP/M-based business programs. In any case, I didn’t notice any delays while actually using a given program, which is where you spend most of your time, anyway. I expect that the Lisa computer you’ll see in Apple showrooms will be slightly faster than the one I saw. As you can tell, I am very impressed with the Lisa. I also admire Apple for deciding to make the system with-out being unduly influenced by cost or marketing constraints. The Lisa couldn’t have been developed without such a deep commitment, and no other company I can think of could afford such a project or would be interested in doing it this way (the Lisa project reportedly cost over $50 million and used more than 200 person-years of effort!). In terms of the actual, as opposed to symbolic, effect it will have on both the microcomputer and the larger-computer market, the Lisa system is the most important development in computers in the last five years, easily outplacing IBM’s introduction of the Personal Computer in August, 1981. As this went to press, Apple announced that the Lisa will be sold in one configuration only: the computer with 1 megabyte of RAM, two floppy-disk drives, the Profile hard disk, the six application programs (Lisa Draw, Lisa Write, Lisa Project, Lisa Calc, Lisa List, and Lisa Graph), and Lisa Test diagnostic program; the price of this package is $9995; it will be available in the U.S. this spring, and modified foreign-language versions will be available this summer. Fortunately for us, the history of computing does not stop with the Lisa. Technology, while expensive to create, is much cheaper to distribute. Apple knows this machine is expensive and is also not unaware that most people would be incredibly interested in a similar but less expensive machine. Well see what happens. It is instructive to see to what degree software is a part of Apple products. The basic Apple II, released in 1977, comes with about 16K bytes of object code. 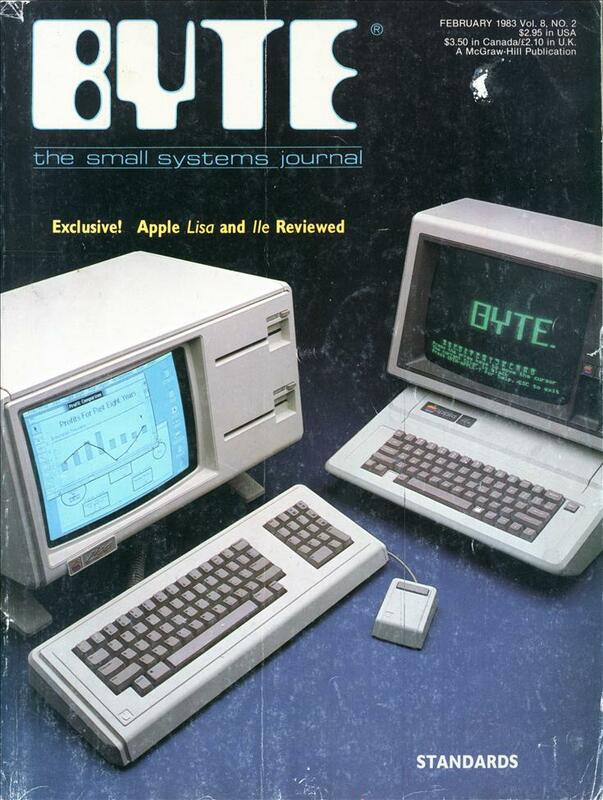 The Apple III, released in 1980, has about 200K bytes of code. The Lisa has more than 2 megabytes (2048K bytes) of code, a staggering figure that hints at the tremendous effort that goes into implementing a good piece of software. The history of microcomputing has been exciting so far because it has enabled individuals working in their spare time to make significant contributions to the state of the art. But that has changed: now most state-of-the-art software is the province of teams of programmers hired by companies, as opposed to individual programmers working for themselves. As programs grow more sophisticated (requiring teams of programmers) and have to be more carefully planned to meet users’ needs (requiring experts in given fields to be added to the team of designers), the implementation of programs is becoming a team effort. The days of the successful entrepreneur/programmer are probably gone. Apple will also be offering the Apple Dot Matrix Printer and the Apple Letter Quality Printer. Apple’s engineers tested many existing printers, chose two (from C. Itoh and Qume, respectively) that best met their needs, then had the companies produce modified versions with Apple-specified hardware and software changes. Apple needed such exacting print quality because the Lisa software is very demanding of both printers. For example, both printers will reproduce almost exactly both the text and graphics that can be displayed on the Lisa screen. In addition, Apple has created special print wheels for its Letter Quality Printer so that you can print normal, italic, underlined, and bold characters without changing print wheels (quite a nice moveâ€”who’s going to change print wheels several times a page just to get true italics?). The amazing thing about the Apple Dot Matrix Printer is that Apple plans to sell it for around $700 (the Letter Quality Printer will sell for about $2100). Unfortunately for Apple II and III owners, these printers’ tricks are done entirely in software on the Lisa and won’t transfer to other Apple computers. I well remember the first time I saw a Lisa and how impressed I was with the graphic interface. The R&D company I worked for at the time bought three. They had a contract to apply the computer(and others) to military uses. The Lisa was a ground breaking macine but not sucessful in the market. I guess the $10,000 price tag in 1983 dollars was just to steep. History on the making. While most hacked away at their PCs (Commodores, Tandy CoCos, Ataris, etc) via the tried and true command line, in comes the Lisa with the GUI. XEROX may have thought about it on the first place but it was Apple who pushed it forward to every-day applications, both companies deserve the recognition on the development of the GUI. Great post! Amazing really – I just made a bar chart in Excel and did exactly the same process. Technological innovation in OS software has really slowed, hasn’t it? Apple’s prices (and the rest of the industry) were really remarkable. My dad bought a laserwriter in I guess about 1990 and it was Â£5000 or so. Well GUIs are actually quite older than what Xerox or Apple had. Just think about systems like GRAIL. Dang! If only I had kept all the video cassettes from the computer store I worked at in the 1980s! I’m fond of saying, “I’m just old enough and just geek enough” when referring to older computer concepts. I am so wrong!!! I had no idea there were computers like this available. LOGO was my first exposure to computers in 1984 which led to a summer school class playing with BASIC programs on an Apple IIE. I eventually had a C64 at home but never programmed much more than random number generators and ASCII art. I’m going to make the mistake of posting a comment before reading the article, but didn’t Digital also have a machine with a GUI and a mouse around this time? The reason I asked is that I recalled a news story run at CNN where I was working at the time that showed a Digital Corp machine and there was mention of the LISA. 25 years have elapsed since that but it stuck in my head. Ok, now that I’ve read it I realize what they were talking about was working up a deal with Digital to utilize LISA systems. Microsoft took note but it took a while, some years back I sold a copy of Windows 2.0 on ebay but not before I tried it out on an old 286 machine. Their idea of a GUI was somewhat limited and a pointing device was non existent. It’s on Jeanine’s desk in the first Ghostbusters movie. Egon plugs it in. Epson had a dedicated word processor/mail-merge system. It was teamed with a near-letter-quality 24 pin dot matrix printer. JSL: I believe you have hit it with the Rainbow. It’s amazing how many different makers and concepts there were back in those pioneering days. Speaking of word processing systems, do you recall one with a “convertible” monitor that could be turned 90 degrees to show an entire page of paper? For some reason I was thinking that old Digital machine had a “tall” screen rather than the more traditional monitor. One little sidebar, when you mentioned the dot matrix printer, I was so proud of my Star NX 1000 when I got it (something like $170) because it had such high resolution for such a low price. The “tall screen” computer was the Xerox Alto from way back in 1973. The 90 degree turn-style monitor, I still can’t find. Are you thinking of the Radius Pivot? I am so glad to be finding out that someone has made it easier to create a way to present difference concepts to be accepted with ease. what’s next? to match the orientation of the monitor. I have an LCD pivot arm (still in the box) that boasts it allows rotating the monitor 90 degrees like that. I have a widescreen LCD. I’ll have to check my video card to see if it supports ‘portrait’ mode. …Actually, the Lisa only became a machine worth bothering with when Sun Remarketing bought up all of (cr)Apple’s unsold, overpriced boxes and converted them to essentially a Fat Mac on steroids – 786K as opposed to 512K, and a 12″ screen to the pathetic 9″ ones all the original Macs sported. Did the 12″ screen still run at the same resolution as the 9″? Or at the original Lisa res? I’ll bet a lot of early mac programs were hard coded for the screen size.